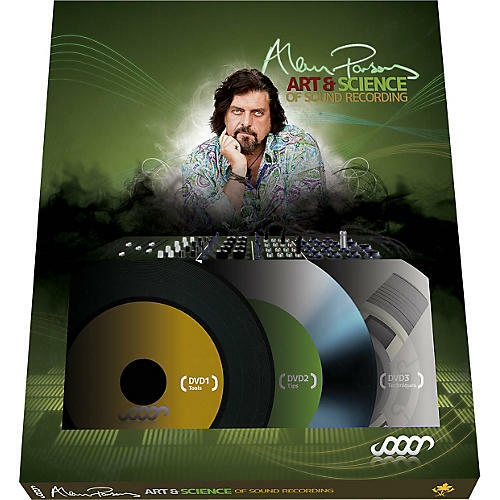 Nearly three years in the making, Alan Parsons' monumental 10-hour video series, The Art & Science of Sound Recording, is now available in a three-DVD boxed set! Narrated by actor and musician Billy Bob Thornton, the DVDs are divided into 24 sections, starting with a brief history of recording. Filmed in HD, this is among the most powerful instructional series ever created for music production. The Art & Science of Sound Recording looks at everything from soundproofing to mixing, and from recording guitar, bass, keyboards, drums and vocals, to recording a choir. Fellow professional engineers and producers join Alan Parsons in this top-quality, practical, and cutting-edge guide, including Jack Joseph Puig, John Fields, Elliot Scheiner, Jack Douglas, Tony Brown and Chuck Ainlay. Artists and musicians interviewed include Michael McDonald, Taylor Hawkins, Nathan East, Rami Jaffe, Carol Kaye and Erykah Badu. This invaluable instructional DVD set applies classic, old-school recording experience to the modern recording scene, and is certain to be a standard work on the subject for years to come. Along with its fully interactive website, The Art & Science of Sound Recording is a complete course in modern recording.